PCB component tombstone is not rare, and many studies of the cause of tombstone have been published. The issue of tombstone has risen to prominence because, while components and assemblies have become much smaller over the last decade, overall assembly processes have remained much the same. As components become smaller, so should your process windows. There was a time when a type II solder paste and chemically etched stencil were acceptable for almost all PCB assemblies. Throughout the 1990’s, type III paste and laser cut stencil became the norm. For those using micro-components today, a type IV paste and electro-formed stencil are quickly becoming a prerequisite. Likewise, equipment that can place components within plus or minus 2 or 3 thousandths is no longer acceptable when placing 0201’s or even 01005’s. Ovens too are becoming more accurate as well. As the flux and solder alloy liquefy and wet to each side of a component, they apply small amounts of torque through surface tension. The torque applied by the surface tension of liquid flux and solder has traditionally been a fringe benefit as slightly misplaced components were pulled to center. However, this method is not suitable in modern electronics assembly because tombstone is caused by minute differences in wetting force from one side of a component to the other. When there is a sufficient imbalance in torque, relative to the mass of the component, the component is tipped upright, consigning the product to either scrap or rework. Chip components have gotten much smaller over the years with many weighing in the milligrams. The same torque that once helped alignment now has the power to tombstone components. The only way to completely eliminate the tombstone effect is to tighten your process. There are many process variables that actively contribute to tombstone. 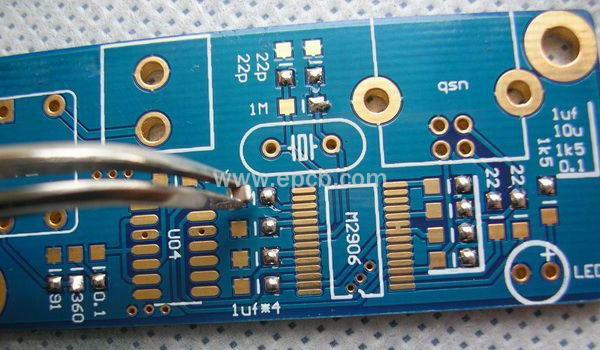 These include, but are not limited to, trace/board design, pad design, component and board oxidation, solder paste, stencil design, print process, placement process, and reflow process. Appropriate modification of one or more of these process variables will reduce or eliminate tombstone.